An Android Library that makes it easy to make grid views with sectioned data and headers that stick to the top. This repository is abandoned and will no longer see any development or support. The replacement SuperSLiM is an implementation of a layout manager on top of RecyclerView. It offers extensible layouts per section, and multiple display modes for headers, including sticky headers. Really, it is better in every way with superior performance, configuration, and is not a hack of ListView, which should completely sell you on it. 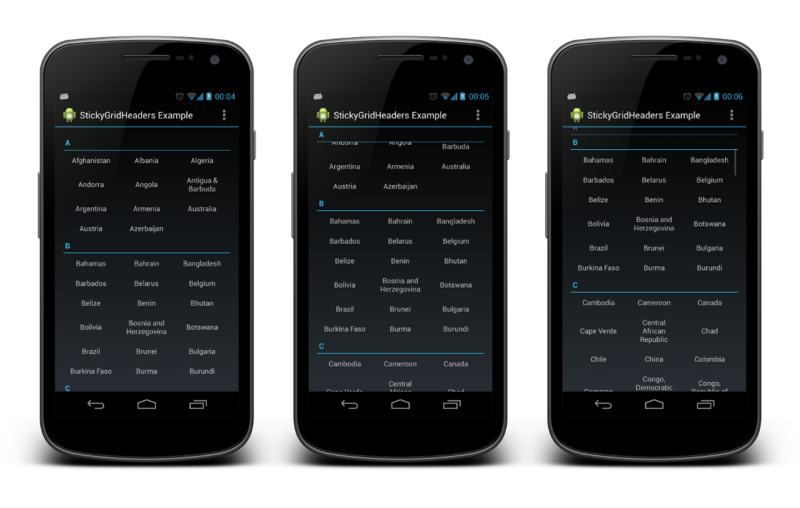 StickyGridHeaders is an Android library that provides a GridView that shows items in sections with headers. By default the section headers stick to the top like the People app in Android 4.x but this can be turned off. StickyGridHeaders also automatically sizes its rows to the largest item in the row. StickyGridHeaders has been designed to be adapter compatible with, and was inspired by, StickyListHeaders. Version 1.0.1 has been released! Development on master will now focus on bringing the headers into the view hierarchy and resolving dpad navigation issues. 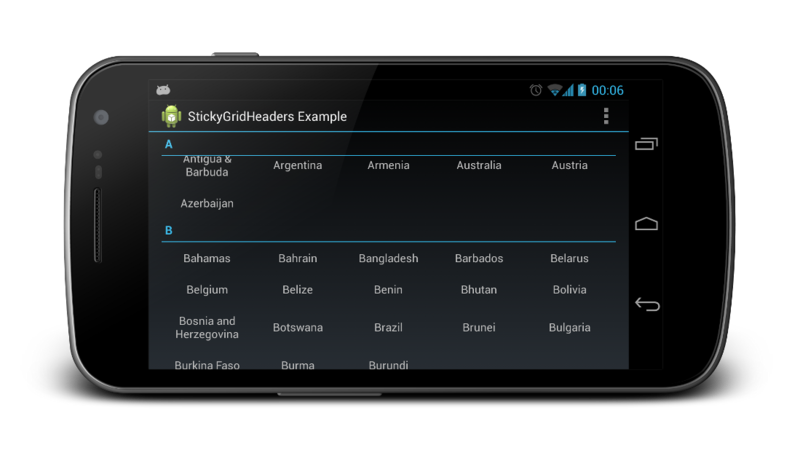 StickyGridHeadersGridView is a drop-in replacement of any GridView in your application and is used in the same manner. To display headers your ListAdapter must implement one of either StickyGridHeadersBaseAdapter or StickyGridHeadersSimpleAdapter. The choice of the implementation allows you to decide between the 'Simple' version which automatically does some housework to enable the grid sections and headers, or the 'Base' version which leaves that work to you so you can implement a specific solution for your data set. The standard ListView is also supported in case you just want the benefit of the improved row height calculations, the rows are sized to match the height of all items in the row, in StickyGridHeaders. The simple adapter interface has the same signature as StickyListHeadersAdapter so if you are using the StickyListHeaders library your adapters are already fully ready for StickyGridHeaders. This library can be used as a .jar file included in the libs/ directory of your project. The latest version is available from Google Drive. The example source code is included in this repository.